OLYMPIA FIELDS, Ill. – Sparked by senior Isaiah Salinda's 1-under-par 69, Stanford forged the third-best final round total and finished eighth on Sunday in the OFCC/Fighting Illini Invitational at challenging Olympia Fields Country Club. Competing in the first tournament of the 2018-19 campaign against a talented 14-team field, the No. 11 Cardinal posted three consecutive scores of 9-over 289 to conclude at 27-over 867. Stanford began the final round in 10th place. Salinda led the surge by tying for 16th, the 11th top-20 showing of his career, at 4-over 214. He captured 19th at last year's event. "Nice to see the guys hang in there," said Conrad Ray, the Knowles Family Director of Men's Golf. "We had a few bumps and bruises, but it was one of the strongest fields we will see all year on one of the toughest courses. To have three first-year players qualify into our top-five bodes well for the future." Oklahoma State won the team title by 18 strokes over USC with an impressive 11-under 829. The Cowboys' Matthew Wolff claimed medalist honors at 6-under 204, edging Colin Morikawa of Cal by one. Four Stanford players placed 31st or higher. Senior Brandon Wu shot 73 on Sunday and tied for 22nd at 6-over 216. Freshman Daulet Tulebayev (75) earned a share of 27th at 8-over 218, while fellow frosh Freddie Lee (72) tied for 31st at 9-over 219. Sophomore Nate Menon (78) tied for 60th at 18-over 226. Competing individually, sophomore Ashwin Arasu (79) came in 69th at 23-over 233. The Cardinal returns to action on Thursday in the first Big Match at Menlo Country Club in Woodside, California. Combined men's and women's teams from Stanford will face Cal in an 18-hole match play competition. "The guys learned a lot and we're eager to see how they play," Ray said. "We're excited about this unique event and really look forward to participating." STANFORD, Calif. – The No. 11 men's golf team starts its 2018-19 campaign on Friday at the OFCC/Fighting Illini Invitational at Olympia Fields Country Club in Olympia Fields, Illinois. Hosted by the University of Illinois, 14 teams will compete in the 54-hole event, including Oklahoma State, the defending national champion and ranked No. 1 in the Bushnell Golfweek Preseason Coaches Poll. The elite field includes 10 schools ranked in the top 25. Last year, the Cardinal finished 11th at Olympia Fields, posting a three-day total of 28-over 868. Junior Brandon Wu paced Stanford with a sixth-place showing, shooting rounds of 72-67-67 to conclude at 3-under 207. Texas A&M won the team title with a score of 3-under 837. Oklahoma State (1), Alabama (2), Texas A&M (4), Stanford (t-11), Cal (t-11), Baylor (14), Illinois (16), USC (20), UNLV (23), Florida State (25), Purdue, South Carolina, Air Force and Indiana. • Stanford will be represented by senior Brandon Wu, senior Isaiah Salinda, freshman Freddie Lee, sophomore Nate Menon and freshman Daulet Tuleubayev. Sophomore Ashwin Arasu will compete individually. • Three days of stroke play. Each team will compete with five players and count the best four scores each day. Stanford will play the first round on Friday with Indiana and UNLV in threesomes starting on the 10th tee from 9:15 a.m. to 9:51 a.m. CT. The second round is scheduled to begin on Saturday at 8 a.m. CT, followed by the final round Sunday at 7:30 a.m. CT.
• Stanford qualified for the 2018 NCAA Championships for the 11th time in the last 14 years. • The Cardinal is led by seniors Brandon Wu and Isaiah Salinda. Wu was an All-Pac-12 first team selection in 2017-18 and registered a team-best three top-five finishes and 70.61 scoring average. Salinda earned honorable mention and sparked Stanford at the NCAA's, where he secured a squad-best tie for 15th and was chosen PING All-American honorable mention by the Golf Coaches Association of America. • True freshmen Fred Lee from Churchlands, Australia and Daulet Tuleubayev from Almaty, Kazakhstan, will make their collegiate debuts at Olympia Fields. 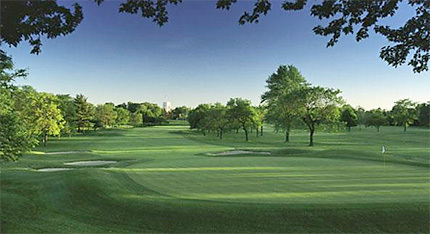 • Teams will play the North Course, one of two at the club. It measures 7,200 yards and plays to a par-70. Designed by Willie Park Jr. in 1919, the course has been ranked among the top 100 in the country by Golf Digest for 20 consecutive years and has hosted many important professional and amateur championships, including the 1928 and 2003 U.S. Open, 1925 and 1961 PGA, five Western Opens, and 2015 U.S. Amateur.